The first electronic instrument, the theremin, was popularized by 1950s scifi films and the original Star Trek theme song. It has no strings and no keyboard, and was invented in the 1920s. Find out how it works. The theremin has no strings to pluck, no holes to blow through, no keyboards to mash or tissues to bang against. It's just a box with two antennae; one vertical rod coming out of the top, and one horizontal loop coming out of the side. The box is connected to an amplifier and a loudspeaker. The theremin is played when someone waves their hands in the air around it. As the hand approaches the horizontal antenna, the volume decreases. As they pull their hands away from the vertical one, the pitch decreases. Theremin players do their stuff by waving their hands and arms over the instrument, without ever touching it. How? Well, the antenna provides a clue. They produce electromagnetic waves. Older io9ers, the ones who once had to dance around their living rooms trying to get the antennae on a TV to show a clear picture, know that the human body is a conductor. Moreover, it's a grounded conductor, considering most theremin players are standing on the ground. As the hand moves, it alters the electromagnetic waves, and changes the sound. 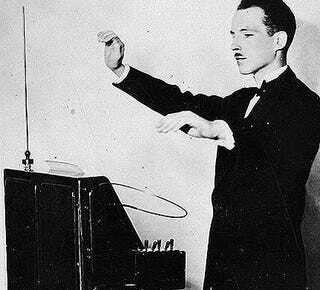 Theremin music is characterized by fast vibrations, due in part to the movement of the hands. It also has a ‘sliding' quality to the sound. It doesn't have to go up or down the musical scale in discrete notes. Instead, it is capable of ‘splitting' notes and producing a smooth, strange wave of sound. Via Worsley School and Swarthmore.